Sukanya Verma revisits Gulzar's Ghalib and finds Barsaat, and Free Love! Seven days of legends and loons, beauty and bane, Dishoom and Die Hard -- doesn’t get more eclectic than this, does it? Some proverbs really need an upgrade. Like fortune favours the brave. At least that’s how I felt on reading the news of Salman Khan’s acquittal by Rajasthan High Court in the poaching case. Ravi, pavak, sursari ki nayin. When Gulzar’s Mirza Ghalib first aired on Doordarshan in 1988, I was too young to understand the splendour of his poesy. But I do recall distracting my mother by constantly hollering ‘Waah, Waah’ into her ears. The embarrassing memory of my immature behaviour is forgotten while binging on the six and a half hours-long television series in a stretch. At the end of it, I am so overwhelmed I have to take a deep breath. In an interview Gulzar attributes Ghalib’s popularity to his accessibility -- he talks about you on your level, in ways you’ll relate and recognise. All through the week I reel in the effect of his sprawling shayari through various phases of life, the lingering heartbreak triggering his melancholy, his inspiring sense of humour to overcome the gloom, the wholehearted friendship he shares with his wife, the dignity in his fascination for a besotted courtesan. And how boldly and breathtakingly Gulzar adapts the legend for small screen in collaboration with Naseeruddin Shah and Jagjit Singh. One of the finest partnerships of all time, it’s a collective milestone for all three. Naturally, it’s all about his poetry but Gulzar also successfully draws an intimate and secular portrait of Ghalib to explain where it’s derived from without camouflaging his weaknesses, arrogance or egotism even as Jagjit Singh blends with the poet’s masterful mind in his masterpiece melody. The greatness of Shah’s performance is how thoroughly he internalises Ghalib. It doesn’t matter if you aren’t an expert in Urdu; his nuances and intensity express their sentiment just as well. Truly, it’s a character he was born to play. In his autobiography, And Then One Day, the actor mentions how even as an FTII student he considered himself ideal for the role. In the 1970s, when he learned Gulzar was planning it as a film with Sanjeev Kumar in the lead, he wrote him a letter of self-recommendation. 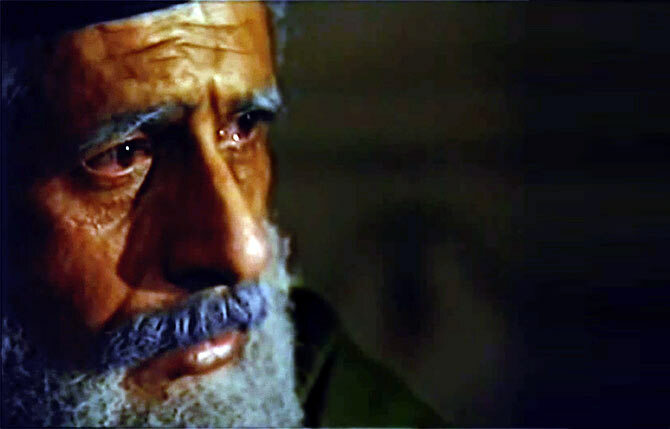 Judge him for all you will but Naseeruddin Shah completely personifies the attitude of hain aur bhi duniya mein sukhanwar bahut achhe kehte hain ke Ghalib ka hai andaz-e-baayan aur. I have a special talent for unearthing Bollywood trash. 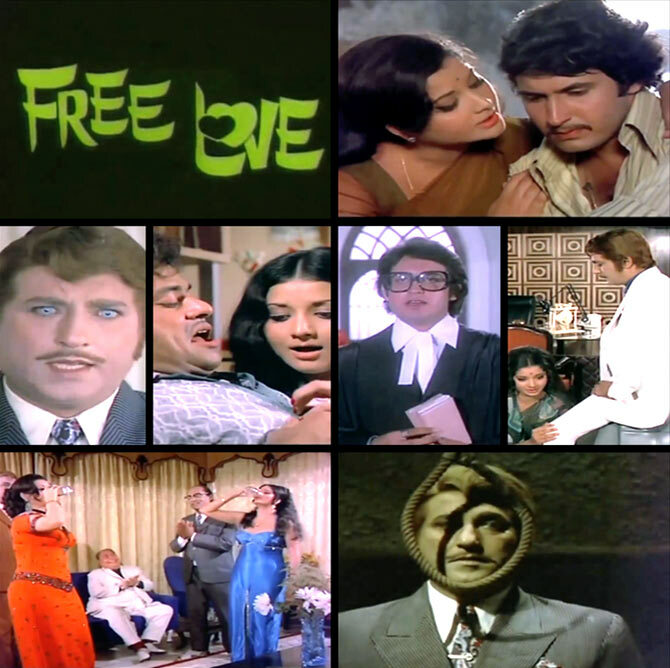 So I discovered the existence of this atrocious and hilarious movie called Free Love. Released in 1974, it’s an exercise for its well-heeled producer Sarvjeet to launch himself as hero/anti-hero. It’s the kind of bizarre experience following which you may want to get your head examined just to confirm it’s still intact. Out of curiosity over its peculiar title and an odd hope of seeing vampires or werewolves, I watched it. All right then, spoilers be damned, here’s what the semi-sleazy B-drivel is about in a nutshell. Family breadwinner Yogeeta Bali (who left acting to marry Mithun Chakraborty) is dating Kiran Kumar’s (back when he still did hero parts) poor law student. She gets a secretary’s job in a creepy faced Sarvjeet’s office (imagine Jagdish Raj in blue contact lenses and a ginger taupe) and promptly changes her wardrobe of sari to skirts. Sarvjeet is a sexual predator, notorious for drugging his all-girls staff and sleeping with them in turns. Instead of suing the jerk, Bali’s colleagues warn her about his dirty tricks helping her escape his advances twice. For some reason, such encounters arouse Bali and she gets all come hither around her real boyfriend. On an outstation work trip though, Sarvajeet begs her to compete with a business rival’s concubine in a drinking game to bag a tender. He takes advantage of her inebriated state while she conveniently envisions Kiran Kumar’s face in Sarvjeet’s. Amazingly enough, no one takes offence over anything. Instead Bali, now no longer ‘fit’ for Kumar wants to marry Sarvajeet -- Main usse apna pati maan chuki hoon. Kiran Kumar has become a lawyer overnight and Sarvajeet gets mawkish about Bali. Finally, Kumar defends Sarvajeet in court but he receives a death sentence anyway. Of course, not before leaving all his wealth and a long letter requesting Kumar to marry Bali. Well, it did promise something ‘Free’ in the title. While working on a story, I came across Salman Khan-starrer Suryavanshi, and it reiterated how Bollywood loves to think of its audience as fools. 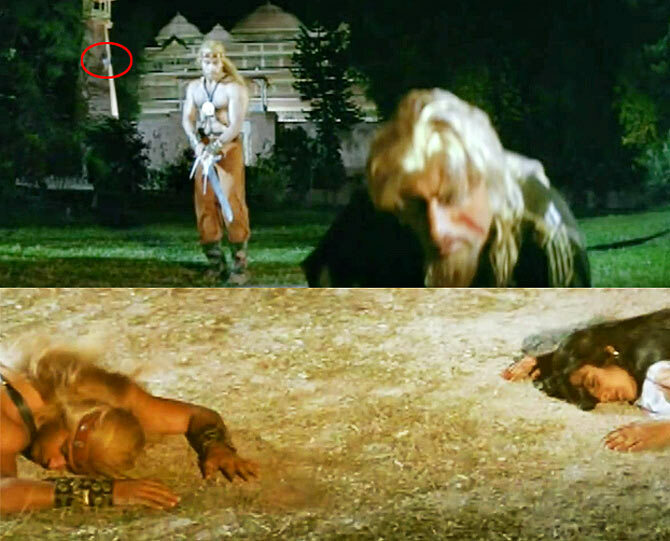 In a scene of this laughable reincarnation drama, Amrita Singh jumps to her death far, far away (see that tiny dot in the marked circle?) while Salman is sword fighting Shakti Kapoor before he collapses as well. Miraculously enough, she lands right next to him in the scene to follow. You know what the say -- Jaate the Japan pahunch gaye Cheen samajh gaye na? Thank God it’s Friday and I am reviewing John Abraham-Varun Dhawan’s Dishoom, which isn’t half bad. Thanks to Dhawan, it’s mostly harmless but would do so much better in presence of cool action, snazzy chemistry and a better-written villain. Later that evening, I catch up on some Bruce Willis with a good portion of Samuel L Jackson on the side. Everything I found amiss in Dishoom is delivered in truckloads in Die Hard with a Vengeance or what I like to call the second best Die Hard in the John McClane franchise. The tunnel action scene, riddles in the park and Jeremy Irons as the vendetta seeking sicko, what’s not to like? Mostly, it’s so thrilling to see the effort behind lavishly choreographed stunts and set pieces before CGI overkill ruined everything. Only thing I didn’t relish is the climax, which drags on excessively, implausibly. Did you know director John McTiernan shot a Russian roulette-themed alternate ending that is a lot darker but makes sense? It was dropped after studios disapproved and demanded a more conventional ending. I am listening to the soundtrack of Maachis, when it suddenly occurs to me that it will be 20 years since Vishal Bhardwaj first charmed us with his exquisite compositions in Gulzar’s political drama, as well as Tabu’s sparkling sensitivity. Twenty years of Shekhar Kapur’s controversial, hard-hitting Bandit Queen. Twenty years of Sanjay Leela Bhansali’s directorial debut Khamoshi: The Musical. Twenty years of Karisma Kapoor’s cosmetic breakthrough in Raja Hindustani. Twenty years of a scorching, seductive Rekha sharing a shower booth with Akshay Kumar or ordering WWF wrestler Undertaker to thrash him in Khiladiyon Ka Khiladi. Twenty years of Raveena Tandon making item songs fashionable as Shaher Ki Ladki in Rakshak. Twenty years of M M Kreem’s divine soundtrack for Sudhir Mishra’s crackling Is Raat Ki Subah Nahi fabulous score. It’s raining incessantly and Barsaat is once again on my mind and screen, this time the run-of-the-mill 1995 confection that served as a launchpad for star kids Bobby Deol and Twinkle Khanna. Though not a great movie, there’s a lot to appreciate about its beautifully shot frames by ace cinematographer Santosh Sivan. Its stars have long left Bollywood’s rat race but the freshness enveloping Sivan’s visuals in the song Nahi Yeh Ho Nahi Sakta, choreographed by Farah Khan, continues to satisfy. I love the luminously lit frames, the use of fresh paint and mirrors and a gorgeous play of pristine white and bright yellow.